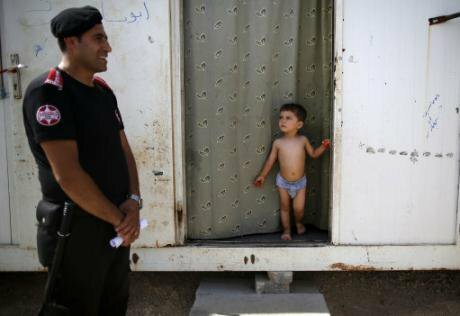 Syrian refugee Mustafa Mahmud, 2, stands next to a security guard at the Oncupinar camp for Syrian refugees at the border crossing with Syria, in southeastern Turkey, June 20, 2016. Emrah Gurel/Press Association. All rights reserved. 2016 now holds the sad record of the highest recorded death toll for refugees on route to Europe. 4,900 people have died trying to cross the Mediterranean. This is 1,000 more than in 2015, despite the number of refugee arrivals in Europe going down by over 60%. At the same time, EU funding to tackle the refugee tragedy has increased. Its primary border agency’s budget increased to €238.7 million, an incredible 67.4% increase compared to the year before. So why is EU funding failing so dramatically to save human lives? Why is EU funding failing so dramatically to save human lives? It also showed that the main EU funding instrument for member states' border security, the Internal Security Fund, was also reinforced with an extra €116.4 million reaching a total budget of €647.5 million for 2016. On top of that came additional money for several 'emergency funding' grants. In September, the European Commission awarded a large sum, €108 million, to Bulgaria. Around 80% of this was to be used for border surveillance equipment and border guards. Around 80% was to be used for border surveillance equipment and border guards. The emphasis of the European Union has been focused on keeping refugees out. This has also been reflected in the migration deal with Turkey. Since the agreement was signed in March, Turkey has dramatically stepped up security at its border with Syria. In spite of a commitment by the Turkish government to live up to international obligations, there are repeated reports of violence against Syrian refugees, including shootings and beatings. Other refugees have been bussed back to the Syrian side of the border. This development can also be seen in the military 'Operation Sophia' run on the coast of Libya, which received additional support from NATO. This operation trains Libyan coastguards, who have a reported history of violence against refugees. In spite of this, the EU wants the Libyan Coast Guard to halt refugees before leaving Libyan waters, in a deliberate attempt to avoid EU obligations under the international law of non-refoulement (ie not returning refugees to places where their lives or freedoms are threatened). The European Commission argues that these and many other measures help deter refugees from making dangerous journeys. Vice-President Timmermans said: “Increasing our ability to better manage migration flows has two fundamental aims: to make sure that all those who need protection will receive it, and to avoid loss of life.” The European Commission argues that these measures deter refugees from making dangerous journeys. Certainly, increased patrols in the Aegean Sea have caused a quick fall in numbers of refugees trying to cross to Greece. However, this has merely led refugees to use other, often more dangerous, routes, contributing to the increase in migrant deaths that we have seen in 2016. “The causes of the increase are multiple: about half those who have crossed the Mediterranean so far this year have travelled from North Africa to Italy – a known more perilous route”, according to UNHCR spokesperson William Spindler. In Bulgaria, militia gangs of extreme-right 'migrant hunters', including a lot of ex-soldiers, have started to patrol the borderlands on their own. Sometimes wearing uniforms and armed with weapons, they try to forcibly expel refugees or hold them and hand them over to the police. Leonardo-Finmeccanica received orders from Croatia and Italy for helicopters for border surveillance, which were partly covered by EU funding. As part of a wider European trend to push border control into the territories of all its neighbouring countries, the German government also donated an array of Airbus equipment for border control, including radar systems, night vision and thermal imaging cameras, to Tunisia. With perverse irony, some of these firms – notably Leonardo-Finmeccanica, Thales and Airbus - are also major sellers of arms to the Middle East and North Africa. With perverse irony, some of these firms – notably Leonardo-Finmeccanica, Thales and Airbus - are also major sellers of arms to the Middle East and North Africa. In 2016, European arms deliveries to this region continued apace, notably to Saudi Arabia, despite its involvement in conflicts in Syria and Yemen that have fuelled the flow of refugees. The European Parliament called for an arms embargo against the oil-rich kingdom, but this was ignored by the Council and by EU member states.